The Keratin Complex Hair Straightening system leaves hair soft, manageable and straight. It infuses a special blend of natural keratin into the hair using the heat from a flat-iron. This hair therapy system is a costly, time-consuming procedure. Therefore, it is important to keep up with the maintenance of your hair at home to achieve the best, long-lasting results. With proper care, this treatment can last anywhere from 3 to 6 months. Purchase a sodium and chlorine-free shampoo and conditioner. Using a shampoo that contains these ingredients can undo your hair straightening treatment. Keratin Hair Therapy by Coppola currently has a line of products that can be used specifically for this treatment system. Wash your hair after you have passed the mandatory 72-hour waiting period. 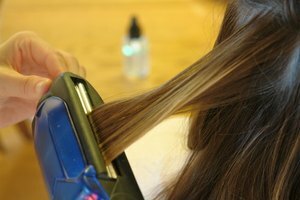 If the hair gets wet during this initial waiting period, it could interfere with the straightening treatment you received. Brush the hair before you wet it. This will prevent hair breakage and tangles. Wet your hair and scalp using warm water. Apply a generous amount of sodium chloride-free shampoo into the palm of your hands and rub them together to lather the shampoo. Massage the shampoo onto your scalp using the tips of your fingers. Work the shampoo down to the ends of your hair. Distribute the shampoo evenly by running your fingers through your hair. Rinse the shampoo out of your hair until the water runs clear. Apply enough conditioner to cover your whole head. Comb your hair with a wide-tooth comb to distribute the conditioner evenly. Allow it to sit for the time recommended by the manufacturer. Rinse the conditioner from your hair thoroughly. Dry your hair with a towel to remove any excessive moisture. Blow dry it as normal and flat iron it. You can wear a silk scarf to keep your hair off your face. 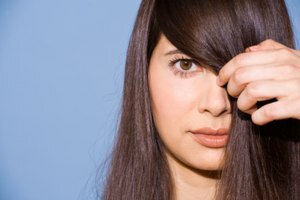 Your hair must be worn down for the first three days after your straightening treatment. No swimming, sweating, exercising, wearing ponytails, bobby pins, head bands and no placing your hair behind your ears.